It is clear that the use of microwave ovens has never fully matured for preparation of frozen foods. Many people still ignore (the inconvenience of) the stir step, where they are supposed to stop the oven, peel back the food covering and stir before a second phase of heating. No wonder so many microwaved meals still come out less than fully cooked, scorchingly hot at the edges or lukewarm inside. This is partially due to the mode patterns of the electric fields in the oven. Microwave ovens are made with metal walls, which are necessary to contain the electric fields, and result in 3-dimensional modal patterns inside the oven, further resulting in uneven heating (cooking) of food. To smooth out the heating characteristics a rotating turntable is utilized. While this does provide better heat averaging, there still is significant variation in the cooking. This paper presents a fundamental approach that can be applied to creating a more uniform electric field distribution within a microwave oven, as the result shown in Figure 1. 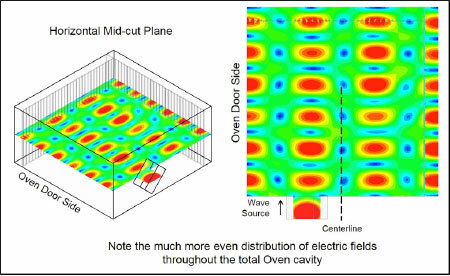 Figure 1 • Comparison of the heating effect between typical and modified ovens, graphically using color to indicate variability of the Electric Fields in a mid-oven plane. In the modified oven design on the right of Fig. 1, note the minimal amount of cold area and the large percentage of the evenly heating green area. Also, the higher density of smaller hot and cold spots supports better conductive heating within the food which contributes to more uniform cooking. 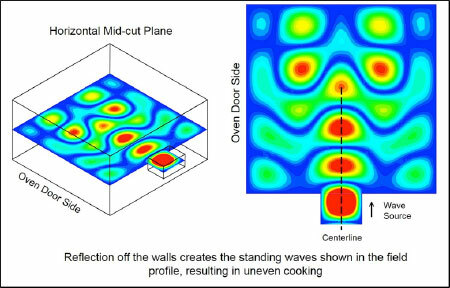 The basic electric field distribution within a microwave oven is a complex set of standing waves, primarily determined by the positioning and shape of the metal walls and resulting in a large variation in field values between the nulls and peaks. This causes uneven cooking in the food, or as most people refer to it as “hot and cold spots.” Many patents have proposed multiple sources, movable elements etc. (not the walls) to try and create more uniform field distribution without much success because the position of the walls are the dominant factor. Therefore, the main method in use today to smooth out the cooking effect is to have a rotating platter so the cooking averages within the oven due to moving the food. The proposed concept here is to introduce grid walls (grid wall = a combination of a grid plus an offset metal wall) into an oven. 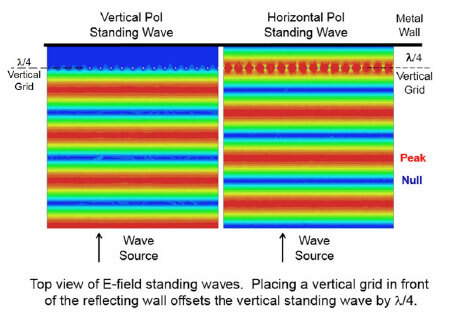 These grid walls provide different reflections to an incident E-field depending upon the polarization of the wave, essentially creating two different standing waves. This allows taking advantage of the fact that when standing waves of separate horizontal and vertical waves are properly positioned with respect to each other (one shifted by λ/4) and on the same axis, the energy sum is a constant, i.e. uniform. The resultant smoothing is by the creation of additional energy modes due to the grid walls that complement those present due to the normal walls. 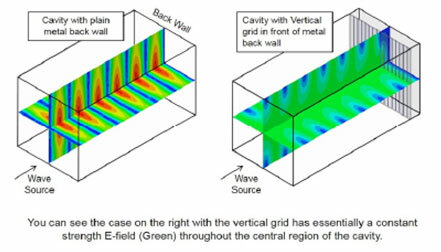 These grids separate the horizontal and vertically polarized waves which then combine into a more smoothed E-field profile. This technique is designed into the oven cavity walls and has no moving parts. It should be understood that this only works perfectly with respect to one reflecting surface (metal wall), and that the energy distribution within a microwave oven is also highly dependent upon the size, type and position of the food placed inside. Therefore, it is not suggested that there will ever be anything close to a perfectly uniform field. However, it makes sense that if the field distribution prior to introducing food is much more even than for a course distribution, then it is likely that cooking with the even distribution will result in a more uniform result than for the course distribution. It would still be worthwhile to include the rotating table under any circumstances. To make this concept work requires the source to provide both polarizations with respect to the oven cavity. This is easily done by tilting the input waveguide 45 degrees with respect to the sides. Secondly, knowing there will be waves scattered all throughout the cavity, particularly when food is inside, it makes sense also to use the grid on two walls, contributing to the “smoothing” of the energy distribution. A third aspect of this approach is to consider the variations in field distribution as a function of positioning the source waveguide entry aperture into the oven. Horizontal and vertical positioning were considered. Consider the E-field of a typical microwave oven. Fig. 2 shows the field distribution through the horizontal mid-cut plane in perspective (left side) and top down views. This oven is 15.5w x 15.5d x 8.25h inches with flat metal walls on all sides, and input source waveguide is centered in the sidewall and is 1.7 inch x 3.4 inch (WR 340). Frequency is standard at 2.45 GHz. The blue represents near zero field and the red is the peak value. Light green is an intermediate value using the same scale as in Fig. 1. Figure 2 • This typical type and size microwave oven makes no effort to even out the E-field distribution. It would contain a rotating table. Fig. 3 shows the E-field distribution of the proposed design. Not only are the values of the nulls and peaks less extreme than for Fig. 2, they are much closer together spatially providing better uniformity of heating through thermal conduction. Figure 3 • Using a few modifications to the oven design can result in a much more evenly distributed E-field. There is a lot more to see in this figure. In the picture on the left side, the perspective view shows the two back walls have vertical grids which reflect vertically polarized waves. The horizontally polarized waves pass by these grids and reflect off the outside metal walls. Both horizontal and vertically polarized waves are excited by the source waveguide which is tilted at 45 degrees. The right hand picture shows clearly the offset of the wave source, the position chosen to create the most even distribution. Also you can see the lines of the vertical grids on the top and right hand walls in this picture. Next let’s address the issue of combining the standing waves of horizontal and vertical waves. Fig. 4 shows two waves coming from the right side, incident upon the vertical grid wall on the left side. The two standing waves shown in the upper plot are created with a quarter wave offset, determined by the positioning of the grid at λ/4 in front of the metal outer wall. Using the grid equation for the TOTAL field is shown above the plots. Remembering that the waves are orthogonal to each other, the Energy equation is therefore the sum of the square of the two waves which is a constant, shown also in the figure. The result is a constant with respect to time and position. This all sounds fine but let’s see if it will actually work. Fig. 5 shows the EM simulations of two individual plane waves, propagating from the bottom towards the top, vertically and horizontally Clearly, the vertical wave on the left reflects off of the grid, and the horizontal wave on the right passes by the grid. Fig. 5 is just a top view of the waves of Fig. 4. 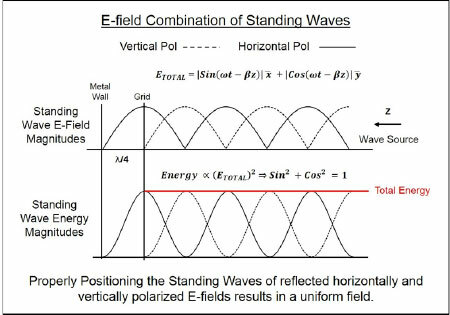 Figure 4 • The grid reflects the vertically polarized wave while letting the horizontally polarized wave pass through. Figures 4 and 5 show how the two different polarizations individually react to the grid wall. Fig. 6 shows how the electric fields of the two polarizations combine when both are present simultaneously. The left side picture in Fig. 6 shows two cut planes through the combination of vertically and horizontally polarized waves when both waves are reflected from the same surface (metal back wall). The result is a strong standing wave pattern on axis and is what happens in a typical microwave oven. Figure 5 • This shows the same effect as in Fig. 4. with the standing wave E-fields generated by EM simulation for both vertical and horizontal incident plane waves. However, when the reflection of the vertically polarized wave is made with a polarized grid at λ/4 in front of the metal wall, the resulting combination is different, as shown in the right side picture. Here we see very uniform field strength region along the axis due to the complementary nature of the two waves, confirming the result of the Energy equation in Fig. 4 above. This effect is the basis for the improvement in a more complex cavity with multiple walls like a microwave oven in Fig. 3. This grid wall design can be used in specialized cases to create a very large uniform heating zone. Interference nulls due to side wall reflections are only near the side walls. Figure 6 • Cut planes showing simulations with a wave source having a combination of the vertically and horizontally polarized waves in a cavity for two different end-wall conditions. Incorporating the suggested design is actually pretty simple. The main change is the addition of the vertical grid in front of two walls. A thin sheet of dielectric would be placed in front of the grids to hide the grids and form the oven working space. Fig. 7 suggests three approaches to create the grid. All three have been run in EM simulations with similar success. The approach used in Fig. 3 is to metalize the stripes on the back of a thin plastic (dielectric) with lines of 80 mils width at a pitch of 500 mils. This grid is spaced 1.2” out from the back wall. The source waveguide is tilted 45 degrees to create equal dual polarizations. Figure 7 • Three ways to make a vertical grid for placement in a microwave oven. Although multiple patents abound with techniques to try and improve the field distribution in a microwave oven, none were found that related to changing the wall reflections. This paper has proposed and demonstrated through the use of EM simulation, a method and steps to make the E-field within a microwave oven more evenly distributed. It is reasonably speculated that starting with a more uniform field prior to introduction of food in the oven will result in a more uniform heating of the food, eliminating “hot and cold spots.” The technique discussed focuses on redesign of two of the walls of the oven to alter the reflection characteristics. The discussion deals with only one size oven but could easily be applied to other sizes. Dr. Robert L. Eisenhart is a consultant with Eisenhart & Associates. Website: www.DR-HFSS.com. Tel: (818) 471-3294. Email: r.l.eisenhart@ieee.org.